Volunteerism accelerates gender equality. This is demonstrated by more than 300 women community volunteers in Rwanda fighting natural hazards in their villages by alerting their communities of early warning signs using radios and cell phones. Participants in the Early Warning Signs (EWS) Training in Rwanda. International Women’s Day 2018 revolves around the theme “Time is Now: Rural and urban activists transforming women’s lives”– women going on the streets, women fighting in their communities, women coming together for their rights. This is happening as much in big capitals of the world as in small communities and villages. UNV is leading a project in Rwanda in collaboration with governmental and non-governmental organizations to enable women to improve their lives and keep their property and families safe in disaster-prone areas. This is vital to accelerate genuinely sustainable development, which includes all members of society and contributes to equality for all genders. Rwanda is a small, landlocked country which has been prone to natural hazards. However, climate change has further increased their frequency and intensity over the last decades. The country has suffered particularly from floods and landslides. In 2016, 50 Rwandans died during heavy rains and landslides, including in 2 sectors in Ngororero District. In 2017 again, at least 20 people lost their lives due to heavy rains. The UNV project covers the districts Karongi, Ngororero and Rutsiro, which are among the most affected and are considered high-risk areas. From 2010 to 2011, 18 floods were counted in these districts by the Ministry of Disaster Management and Refugee Affairs (MIDIMAR). In Ngororero, even flash floods occurred. During the same time, 13 landslides interrupted economic and social life. Such disasters have devastating effects on properties, livestock, crops and infrastructure, impacting the possibilities of economic development. UNV, in partnership with the Rwandan government, UNDP, the Ministry of Disaster Management and Refugee Affairs (MIDIMAR), the Ministry of Local Government (MINALOC) and other agencies, is working on empowering rural women in acquiring DRR skills and equipping other women and communities with skills to reduce the devastating effects of such natural hazards. The project ‘Enhancing Disaster Risk Reduction Strategies among Rural Women through Volunteer Action’, to which UNV is contributing US $100,000, has mobilized more than 400 women volunteers in three districts in Rwanda since its start in 2016, provided technical support to the government and has started to create watch-dog committees to coordinate and monitor disaster preparation and response. The project plans to mobilize up to 1,000 women volunteers in the three districts and train them in identifying risks and communicate early warnings to communities. Of these women, 100 will further be trained on using mobile phones to call local radio stations and deliver early warning alerts. The stations can then broadcast warnings and advice to communities, limiting the risk of people being killed or injured and giving them a chance to put actions in place to safeguard their farms and animals. 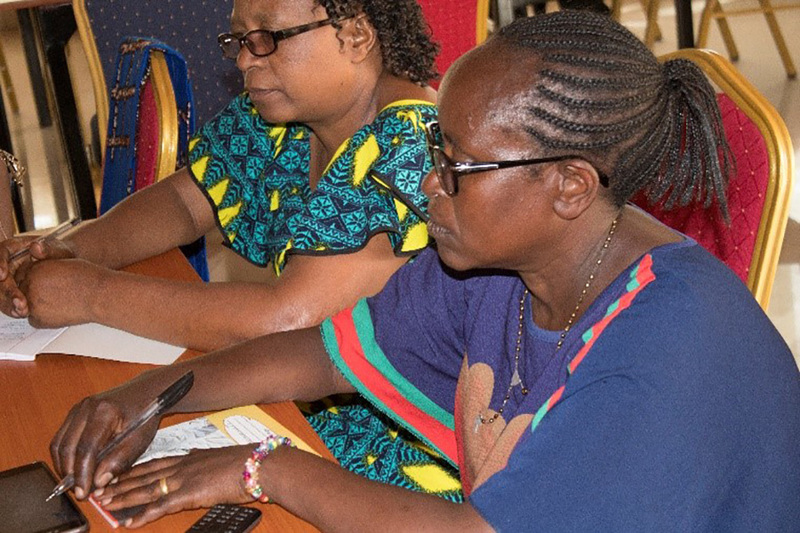 Another major outcome of this project is the development of a Handbook for DRR Practitioners in Rwanda called “Applying Gender Equality Principles on Disaster Preparedness” and a “Community-Based Early Warning Systems Training Manual”. The latter is currently being translated into Kinyarwanda to ensure access for people who do not speak English. Together with the UNV Field Unit in Rwanda, one UN Volunteer worked on the project. Valeria Drigo is from Italy and has a background in International Relations. She acted as the Environment and Disaster Risk Reduction Project Coordinator for the project. Valeria cooperated with district officials to prepare workshops to raise awareness of disaster risk reduction strategies in the communities. Further, she prepared training content and liaised with district representatives on content creation and logistics preparation. Women have often been excluded from such DRR processes, even though they are often particularly affected by disasters as their workload increases and they struggle to access resources, according to UNV research. At the same time, women have been proven to be exceptionally able actors in DRR processes; they are known to have the strongest social networks within communities which enables them to quickly mobilize survival efforts in case of disaster, e.g. organize emergency kitchens. As is the case with many UN Volunteers, Valeria works at the community level. This aids UN Volunteers in genuinely improving social mobilization, advocating for women’s equal involvement in local development and decision-making, and encouraging real societal transformation. The project has now progressed to qualify 300 women as Training of Trainers on Basic Early Warning Systems and a further 100 have taken advanced training on Early Warning Systems. Currently, the trainers have commenced supervised training of 300 women at the Sector level and another 300 at the Cells level in the form of Open Community Meetings and drills. “This helps them in being able to cope with disasters and spot early signs of them. This is a first step in ensuring that women are generally more active in DRR activities and playing a role in providing and sharing disaster-related information between government representatives and communities,” says Valeria and highlights that sustainability of the project is a priority. That’s why women are encouraged to cascade their acquired skills to other women and communities: “This is also pivotal to create a network that people can rely upon in case of emergency,” says Valeria. Agnes Uwamahoro is one of the women volunteers. She also acts as the National Women’s Council Leader for Rutsiro District. “During the training, I learned that it is good to understand our physical environment in order to be able to live in it. In this case, I learned about the various risks related to natural disasters, and how to reduce them. I understood that hazards (caused by human actions), vulnerabilities (resulting from our physical, social activities) and exposures (related to how and where we construct human infrastructure) should be either eliminated or reduced as a measure to manage disasters.” --Agnes Uwamahoro, volunteer. The project in Rwanda shows that volunteerism does not only enhance development; it accelerates sustainable development. The mobilized women volunteers are now part of reducing the effects of disasters, effectively integrating them into local decision-making processes – ensuring societal transformation and more genuine gender equality. As Agnes puts it: “Volunteerism means serving communities selflessly, and with the intention of making living good for everyone. I offer my time for free to provide vital development, social and health information to women in my communities to help them improve their situations.” These Rwandan women are now rural activists transforming women’s lives every day, taking ownership of their safety and future.